last year, joshua and haruko, the main instigators/driving force of the dae, asked me if i’d like to collaborate on some song writing for the next album. i assented; working in a musical fashion with those two was something i’d been itching to do for years. unfortunately, my chops had never been proportionate to the task. luckily, all i was asked to do was contribute lyrics and some vocal lines. lyrics i can spit all day if given the impetus. melodies? much the same. eventually the dae (which now includes composer jeff houston) asked if i’d consider coming on to their latest production as scripter, actor/dancer and to even perform some of those songs i’d helped to lyricise. i of course said yes and my life has been made much richer thereby. sonic tales will debut in seattle in october over the 30th and 31st of october at the moore theater. in april we all fly out to manhattan where the new museum will be hosting us for a residency slash incubation. we’ll be doing some filming out there and probably play some public participation games (guerilla theater? does that still exist? ); the new museum will be hosting a working production of whatever ideas we’ve generated and refined on the 16th and 17th of april. more details on that as they come. that’s enough for now. if anyone has any ideas for promoting our work while in nyc please feel free to contact me at artofmulata ATsign gmailDOTcom. sorry for the dopey obfuscator. you can also go to the contact link at the top right of the page. 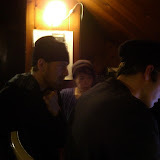 here are some far too dark photos of the dae recording some tracks at inphase productions here in seattle. i’m not in the pics as i was shooting them. make of them what you will.